"Are you really taking that beautiful baby girl to Africa?" the old British colonial officer asked the young missionary couple in 1948. "Don’t you know that’s the white man’s grave? She’ll probably be dead in six months and maybe you too.” More than 70 years later, that beautiful baby girl, Anne Dreisbach, is still serving the Lord as a medical missionary, using the medical training she received at Bob Jones University and Greenville General Hospital (now Prisma Health) to share the gospel of Jesus Christ with the people of Suriname. "When I was an infant in West Africa, my father used to carry me around the leprosarium (center for treating leprosy) in his sun helmet, little imagining, I think, that this tiny daughter would follow in his footsteps by serving the Lord as a medical missionary for these many years," says Anne. But follow in his footsteps she did. Anne’s mother and father, John and Bettie Dreisbach, were certain God wanted them in Africa, and they pioneered a medical and evangelistic ministry at a leprosarium in Kano, Nigeria. Young Anne grew up watching her mother and father minister to both the physical and spiritual needs of the local people. She accepted Christ as her Savior as a young first grader, and she knew immediately what she wanted to do with her life. But Anne soon found out that not everyone was as excited about her plans to become a medical missionary as she was. She was admitted to nursing school in 1966 and was soon told that she was too fragile and too petite to pursue her goal of serving the Lord on the mission field. Still, she knew that God had called her to missions, and nothing was going to keep her from running as hard after Him as she possibly could. In 1975, Anne accepted her first term of service in the Sahara Desert, where her parents helped her learn the ropes. Her medical ministry, Project Compassion, operated first along the Algerian border and later along the Mali border, where she shared the hope of the gospel with patients as she pulled teeth, sutured lacerations, and immunized babies. But in 1980, Anne faced another roadblock. The Muslim government in the region expelled her from the country, and Anne knew it was time to seek God’s leading about her next steps. Sever any tie save the tie that binds me to Thy heart. Lord Jesus, my King, I consecrate my life, Lord, to Thee. Anne prayed earnestly about where the Lord wanted her to serve Him, and he led her to the small country of Suriname in South America. God confirmed her calling with the words of Isaiah 50:7: "For the Lord God will help me; therefore shall I not be confounded: therefore have I set my face like a flint, and I know that I shall not be ashamed." Anne claimed this verse for her ministry in Suriname, and quickly set about the task of taking the next step in her service for God. Many of the people in Suriname are the descendants of runaway slaves who originally came to the New World from Africa. Anne’s African upbringing and love for the African people served her well as she forged new friendships and connections on the other side of the Atlantic. Today, Anne’s clinic offers general medical assistance, maternity care, well baby immunizations, and urgent care such as pulling teeth or suturing wounds. 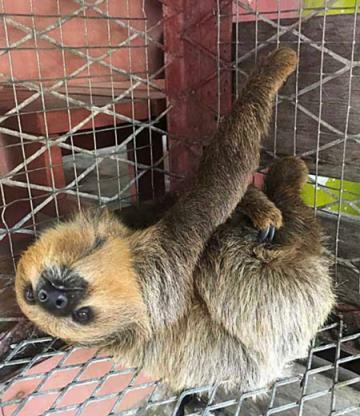 She also cares for dogs, cats, birds, pigs, and even a young two-toed sloth that had suffered a gunshot to the leg. She endeavors to share the gospel with every patient (the human ones, anyway!) by handing out tracts and Scripture portions and selling Bibles to put the Word of God into the hands of the people. In addition to her medical work, Anne teaches Bible classes and Sunday School classes and heads up a Bible memory program so that her friends and neighbors will have the Word of God in their hearts as well, not just in their hands. She also offers classes on health-related subjects with a Bible application in the river villages and in local schools. Anne’s ministry has reached beyond the borders of Suriname to impact visitors from other countries, including two young medical students from the Netherlands who came to observe her clinic. “They were impressed with the fact that I would have devotions and pray with the patients before seeing them,” says Anne. “One of the students gave me her email address and requested that we stay in contact. On a rainy Sunday in March of 2018, Lantiwee villagers and others who attended the worship service that morning joined Anne in celebrating her 70th birthday. Just one month later, Anne received word that her older brother John, a veteran missionary to the Philippines, had finished his race and was home in Heaven with the Lord. "The day after I received the news of John’s move to his eternal home, a steady stream of villagers began stopping by to express their condolences. That evening the men of the village came to sit with me for about an hour and a half, following a local custom. For a number of days, villagers continued to drop by to check on me and make sure I was doing all right. As one villager said, 'We live together. Thus we need to grieve together.' "
Anne’s heart always has been and always will be committed to serving the Lord by sharing the gospel with those who have never heard. But she knows that if the ministry in Suriname is to survive, it needs new workers to answer the call. The team needs missionaries trained to work with children, teens, and ladies in the city, towns, and the interior. They also need people with musical talent, those with the ability to provide training sessions for national pastors, and someone to direct the Christian radio station and provide Bible literature in the local language. 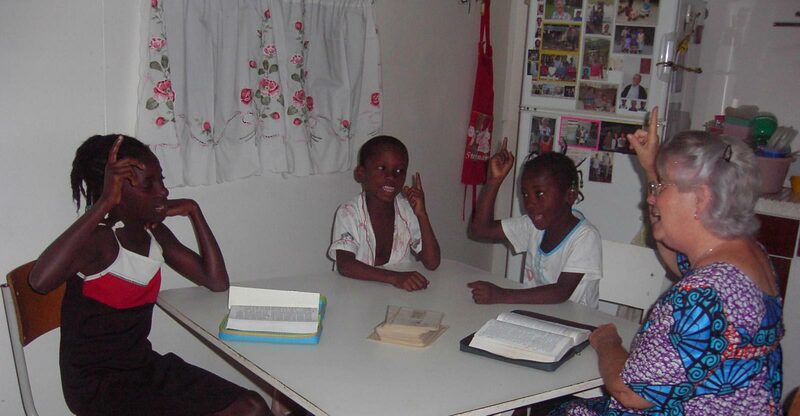 But Anne is confident that the Lord will provide the next generation of workers to continue the ministry in Suriname. "The ministry God has given me is incredibly unique," says Anne. "Spiritually it goes far beyond standing before a group of people and teaching them God's Word once or twice a week. It reaches deeper into the lives of people than caring for their physical and emotional needs through medicine. My living in their midst is bit-by-bit changing the very fiber of their lives—ideology, reaction, performance, etc. It's thrilling to stand back and see the change. Under His shadow, I live among the heathen and in the shadow of His wings, I rejoice."